Scientists and engineers are testing new technologies using a rover at NASA's Ames Research Center. The robot is also being used to appraise new gear for Mars exploration. 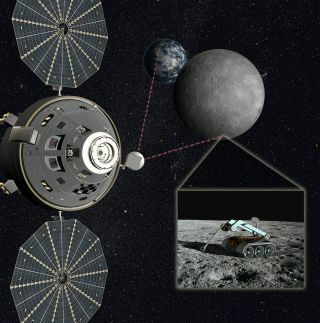 In a near-term test, the rover will evaluate deployment of lunar equipment, which would be controlled by astronauts on the International Space Station. Supported by the NASA Office of the Chief Technologist, Burns is working with the space agency's Ames Research Center to use a rover to simulate deployment of polyimide film antennas as they would be deployed on the lunar surface. Leonard David has been reporting on the space industry for more than five decades. He is a winner of last year's National Space Club Press Award, a past editor-in-chief of the National Space Society's Ad Astra and Space World magazines, and has written for SPACE.com since 1999. Follow SPACE.com on Twitter @Spacedotcom. We're also on Facebook & Google+.